A great number of purchasers just love the Adidas Harden Vol. 1. 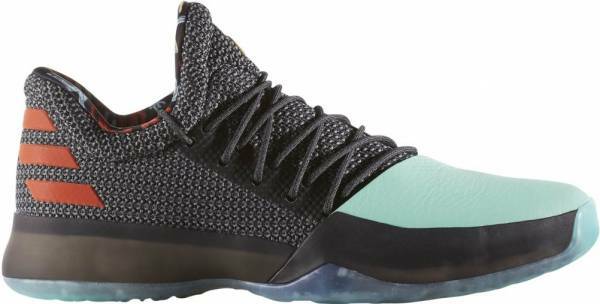 Majority of the reviewers agree that these J Harden sneakers are very comfortable. Many users appreciate the balanced feel of the full-length Boost; it gives the right amount of impact protection and court feel. Like the UA Curry 6, several note that the Harden Vol. 1 is perfect for guards. Many commend how the shoe is built. It’s well designed and uses quality materials. A lot notice that the shoe’s traction works really well. These James Harden basketball shoes have a unique style and look very nice, a good number state. Similar to the Adidas Harden's 3rd iteration, the Vol.1 alternates as a lifestyle sneaker. The shoes fit great according to some wearers. The shoe's lacing provides a comfortable lockdown, a few observe. Some say that the Harden Vol.1 provides good ankle support for a low-top shoe. They notice that the heel and tongue areas are nicely padded. These Harden basketball shoes run long according to several wearers. They recommend going down half a size. It takes a while to break in the Adidas Harden Vol. 1, several observe. Some users note that the leather toecap feels awkward and is a bit of a hindrance. The leather creases and digs in the forefoot; causing pain. Some notice that the traction pattern holds dust and the grip is a bit inconsistent. Frequent wiping is recommended. Putting the laces through the double eyelets is a chore, a handful comment. They also say that the laces are too short and get untied easily. Premium materials, responsive and low-to-the-ground cushioning, good traction, and support. The Harden Vol. 1 doesn’t excel in any particular category; however, it is a well-rounded sneaker. With the lowest profile of any full-length Boost basketball shoe, the Adidas Harden Vol. 1 is best suited for guards who value court-feel and mobility. Bigger players who don’t rely on athleticism will also enjoy this shoe. The Harden Vol. 1 is also suitable for casual wear due to its all-around comfortable and polarizing design. These are one of my go-to shoes. So the Harden Vol. 1 turned out to be a BEAST. To sum up, this model is perfect for guards. It is now my go to basketball sneaker. The Adidas Harden Vol. 1 takes it back to 2007 when James Harden led his Artesia High School to their second straight state title. These shoes from the Three Stripes pay tribute to Harden’s early years at Artesia High School by featuring his team colors; stats from the senior's championship game are detailed on the sock liner. The Harden Vol. 1 is designed for James Harden’s high-energy style of play. These shoes are made with Boost cushioning for energy return, and the leather toe shroud is designed to protect him from defenders stepping on his feet. Cushion. Made with full-length Boost, the Adidas Harden Vol. 1 offers ideal comfort and responsiveness. Its low profile provides the perfect balance between court feel and impact protection. Boost is Adidas’ most responsive cushion. It improves energy return, making dynamic and explosive movements possible on the court. A TPU midsole wrap adds stability and reduces lag time when making quick moves. Traction. Adidas mapped the pressure points on Harden’s foot and developed a traction pattern that grips better on high-impact and high wear areas. The result is a Fibonacci-inspired tread pattern that provides the ultimate grip for lateral movements and quick changes in direction. Length and Width. The Adidas Harden Vol. 1 is said to be wide-foot friendly. Wide-footers can go true to size while regular and narrow footers are advised to go down half a size. Lockdown. The Adidas Harden Vol. 1 features a wraparound tongue construction for a lockdown fit while asymmetrical lacing eliminates pressure on the top of the foot. The asymmetrical design matches the anatomy of the foot and delivers a clean flex and natural movement. A torsional plate adds midfoot support, and an internal heel counter locks the heel in the footbed. The upper is made of knitted mesh backed by nylon for support. The breathable and flexible upper of the Adidas Harden Vol. 1 features an independent toe cap for extra protection and durability. As with other Adidas models, the materials featured varies depending on the colorway. Cut low for speed; the Adidas Harden Vol. 1 wakes the game up with a black knit upper accented with his red and white team colors. The unique 3-Stripes heel design is exclusive to James Harden, giving that stand-out look. The shoe also debuts the "Harden Mark”; a logo that fuses elements from the center circle at half-court, the Adidas three stripes, and the letter H.
While the Harden Vol. 1 is meant for the basketball court, it can also be worn casually. Its low-top design makes it perfect to wear with jeans. Just like the bearded one himself, these sneakers excel in both performance and style. Adidas went all out with James Harden’s first signature sneaker. A wide variety of colorways were released to celebrate important moments in his life. Adidas launched this colorway to celebrate the 2017 All-Star festivities held in New Orleans. The AS ‘No Brakes’ feature a gray upper with orange and purple accents. This special pair of black history basketball shoes pays tribute to the legacy of three-time Grand Slam winner Arthur Ashe. This basketball shoe features an oreo-like upper, white toecap, and a striped sockliner. Similar to the ‘Fear The Fork’ colorway, the ‘Cactus Kid’ is a nod to James’s time at the State of Arizona. The shoes feature a black mesh upper, a teal toecap, gold accents, and solar orange stripes. A cactus graphic seen on the sockliner completes the desert-inspired theme. This colorway celebrates James’s historic 2016-2017 season where he placed second in the NBA MVP voting. This colorway features a white mesh upper, a black nubuck toecap, and gold accents. Participants of the 2017 Adidas Uprising Tournament were outfitted with a player exclusive colorway of the Harden Vol. 1 and Crazy Explosive (high and low). This camo colorway features earth tones on the upper with a suede forefoot. The launch colorway of the Harden Vol.1 Primeknit was inspired by a letter James wrote to his mother when he was just a kid. These basketball shoes feature a black upper with metallic gold speckles, a toecap made of premium nubuck, and a semi-translucent outsole. To celebrate James’s birthday, Adidas released a premium version of the Harden Vol. 1. Limited to only 89 pairs, these basketball shoes are made of a one-piece Horween leather upper finished off with a gum outsole. Retailing for $350, these basketball sneakers are the most expensive Hardens to date. Adidas and Pensole Academy collaborated to create a special version of James Harden’s first signature shoe. Inspired by James’s “brothers through everything” motto, the Pensole Academy X Adidas Harden Vol. 1 features a patterned mesh upper with textured overlays. These basketball shoes are dressed in burgundy with hits of yellow. The ‘Pionner’ colorway is inspired by James’s second-straight high school State Championship. It features a black knit upper mixed with a white leather toecap. Hits of red complete the shoe’s silhouette. A Houston Rockets-inspired colorway, the ‘Red Glare’ pays tribute to the fans, aka the Red Nation. These basketball shoes feature a scarlet and collegiate blue digital camo upper with a scarlet toecap. This pair of all white basketball shoes is inspired by James’s practice of hosting a yacht party during his birthday. It features a specially made maritime Harden logo on the sockliner and outsole.